Grand Theft Auto: Vice City (also referred to as GTA Vice City, Vice City and GTA VC), is the sixth game in the Grand Theft Auto series and the second game in both the GTA III Era and 3D Universe. The game was directed by Navid Khonsari, designed and developed by Rockstar North and published by Rockstar Games. The game was initially released on October 27, 2002 in the United States and Canada. By the end of 2002, the game had also been released in Europe and Oceania with a PC and Xbox release coming in 2003 and 2004. The game is also now available on iOS devices, Android devices and the PlayStation Network. GTA Vice City was also released as part of Grand Theft Auto: Double Pack for the Xbox, along with Grand Theft Auto III through Rockstar Vienna. The game revolves around the exploits of protagonist Tommy Vercetti after his arrival in Vice City in 1986. 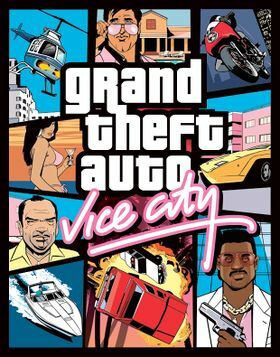 The game is set two years after the events of Grand Theft Auto: Vice City Stories, six years before Grand Theft Auto: San Andreas, twelve years before Grand Theft Auto: Liberty City Stories, fourteen years before Grand Theft Auto Advance and fifteen years before GTA III. It uses a tweaked version of the Renderware game engine used by GTA III, and similarly presents a huge cityscape, fully populated with buildings (from hotels to skyscrapers), vehicles (cars, motorcycles, boats, helicopters, and planes) and people. It also introduces over-the-top-gameplay that was later included in the games Grand Theft Auto: San Andreas, The Ballad of Gay Tony, and Grand Theft Auto: Chinatown Wars. GTA Vice City's protagonist, Tommy Vercetti. Having just made it back onto the streets of Liberty City after a long stretch in maximum security prison, Tommy Vercetti is sent to Vice City by his old boss, Sonny Forelli. They were understandably nervous about his re-appearance in Liberty City, so a trip down south seemed like a good idea. But all does not go smoothly upon his arrival in the glamorous, hedonistic metropolis of Vice City. He's set up and is left with no money and no merchandise. Sonny wants his money back, but the biker gangs, Cuban gangsters, and corrupt politicians stand in his way. Most if not all of Vice City seems to want Tommy dead. His only answer is to fight back and take over the city himself. From the decade of big hair, excess and pastel suits comes a story of one man's rise to the top of the criminal pile as Grand Theft Auto returns to the PlayStation 2 computer entertainment system this October. Vice City is a huge urban sprawl ranging from the beach to the swamps and the glitz to the ghetto, and is the most varied, complete and alive digital city ever created. Combining non-linear gameplay with a character driven narrative, you arrive in a town brimming with delights and degradation and are given the opportunity to take it over as you choose. As a major gateway to South America and the Caribbean and attracting migrants, Vice City is brimming with diverse characters, so there's a friend for everyone. It is a sociable place and the new guy in town is sure to meet all manner of friendly people in the sunshine capital of America. Athletes, pop stars, real estate developers, politicians, trailer trash, everyone is moving to Vice City to find out what makes it the number one growth city in America. But, as Tommy quickly finds out, trust has been overtaken by drug lords, gang violence, and the police. Vice City offers vehicular pleasures to suit every taste. For the speed enthusiast, there's high-performance cars and motorbikes. For the sportsman, a powerboat or a golf buggy lets you enjoy the great outdoors. For those that need that sense of freedom and escape, why not charter a helicopter and see the beauty of Vice City from the air? As the party capital of America, you would expect your ears to be seduced by a host of sultry melodies and pumping beats, but the city is truly rocking. You'll be amazed as you sweep through Vice City's FM dial. If you are feeling like trouble, you can tune into some driving rock, or some crucial electro, or maybe you want to slow down with some sweet soul, and there will always be some great romantic anthems if you want to really take your mind off things, or maybe you want to have a good laugh and listen to Talk Shows. For the action man, or outdoors type, there's tons of fun things to do and adventures to be had… guaranteed. For the secretive or creepy type, Vice City is full of surprises, a place where you'll constantly be surprised by the vivacious, fun-loving types who live there and the things you can discover. GTA Vice City is arguably the most heavily themed Grand Theft Auto game, taking influences from a wide range of classic 1980s movies, television series and music. Perhaps the closest real-life counterpart to GTA Vice City is the television series Miami Vice. Aside from the broad-ranging similarities (80's music,--including new wave, glam metal and synthesizer pop-- organized crime, drug trafficking, styled cars, pastel clothes etc), several specific references are included. For example, at a 3-star wanted level or above, two undercover police officers who strongly resemble Crockett and Tubbs--the primary characters from the aforementioned TV series--will chase the player in a VCPD Cheetah, which is itself styled after the 1986 Ferrari Testarossa, Crockett and Tubbs' vehicle of choice in the latter three series of the show. Another direct link to Miami Vice is the inclusion of "Crockett's Theme," a pivotal piece of instrumental music from the show, on the in-game radio station Emotion 98.3. The game's intro theme is also in the style of the "Miami Vice Theme". One of the primary characters, Lance Vance, is voiced by Philip Michael Thomas, who portrayed Tubbs. Several vehicles in Vice City are also taken from the TV series, including the Squalo (Sonny Crockett's speedboat), the Stinger (Crockett's car for the first two seasons), and the Infernus. Another significant influence on GTA Vice City is the 1983 film Scarface, starring Al Pacino as Tony Montana. Several in-game locations, such as the mansion that becomes the Vercetti Estate, are obviously styled after locations featured in the movie. Elsewhere in the city, there is a hidden apartment containing a chainsaw within a blood-stained bathroom, a nod to Scarface's infamous chainsaw torture scene. The game's final mission mirrors the end of the movie; in both the main character is assaulted by an army of goons at their mansion, although crucially Tommy Vercetti lives, whereas Tony Montana is killed. 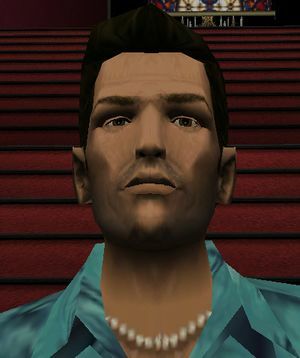 The "Mr. Vercetti" outfit available from the The Pole Position Club strongly resembles an outfit worn by Tony Montana, and even Tommy Vercetti himself takes many character and lifestyle traits from Al Pacino's character, specifically his short temper and heavy dealings in the cocaine trade. It is also worth noting that the radio station Flashback FM from Grand Theft Auto III features the songs that were written for Scarface; the developers acknowledged the film as being a major influence on the overall rise-to-criminal-power theme of that game, and the soundtrack was included as an homage. Carlito's Way - Ken Rosenberg, Tommy Vercetti's lawyer and adviser, looks and acts like Sean Penn's lawyer character from the movie. To Live and Die in L.A. - later in the game there is a money counterfeiting scheme based on the movie. A song from the movie's soundtrack ("Dance Hall Days" by Wang Chung) is also included on the in-game radio station. Reservoir Dogs - Mr. Black and Leo Teal (who is referred in-game as Mr. Teal) are a parody of the cult classic film due to their surnames being colors, as are the code-names of each of the robbers in the film. Speed - In the mission Publicity Tour, a murderous fan of Love Fist plants a Boomshine bomb in the Love Fist Limo that Tommy Vercetti and Love Fist are sitting in. Tommy has to drive around Vice City without dropping the limo's speed, or else the limo will explode. This is a nod to the film Speed, which features an identical scene except with a bus instead of a limo. Red Dawn - an Ammu-Nation radio advertisement calling this 1984 movie about a fictional Soviet invasion of the United States a "documentary" is just one example of the game's lampooning of 1980s American paranoia towards communism. Village People - a builder, a police officer, a soldier, a firefighter and a biker can be seen dancing on stage in the Malibu Club. Cars associated with 1980s pop culture - many of the game's vehicles are look-alikes of popular/famous vehicles from the time, such as the Deluxo, which is a nod to the DeLorean. Pablo Escobar - possibly the most notorious Colombian drug dealer ever to have lived is alluded to by the name of Escobar International Airport. Hair Metal - as well as the rock/metal station V-Rock, a fictitious in-game metal band Love Fist spoofs many 80s rock clichés in the style of Spinal Tap. Promotional art for GTA Vice City 10th Anniversary Edition. In October 2012, Rockstar Games announced that a mobile edition of GTA Vice City was to be released in order to celebrate the 10th anniversary of the game's release. Much like the mobile edition of GTA III, the game will be released on both iOS and Android devices. A month later, Rockstar announced the release date for the game to be December 6th, 2012. At the same time, the list of supported devices was announced. The game was released for iOS devices on December 6th as planned, however a technical error prevented the game from being released on Android devices which forced the release of the game on these devices to be postponed. The game was subsequently released on Android devices on December 12th, 2012. Along with the release of the game, a few updates to the list of supported devices was made. In 2012, ESRB rated both GTA III and GTA Vice City for the PlayStation 3, which led a lot of fans to believe this confirmed the games for a future PlayStation 3 release. However, these ratings were later retracted, probably by Rockstar demands. After these retractions, no further information was released from Rockstar. On January 30th 2013, Rockstar announced that GTA Vice City had officially been released on the PlayStation Network, making the game available for players on the PlayStation 3 platform. GameSpot rated the game 9.6/10, giving it an Editor's Choice award. Its record was surpassed by its successor Grand Theft Auto: San Andreas. The game quickly became the best-selling video game of the year. GTA Vice City also appeared on the Japanese magazine Famitsu's readers' list of 100 all-time favorite video games in 2006. The logo sequence for GTA Vice City is reminiscent of the Commodore 64 BASIC command prompt, which was common during the time when the game was set. 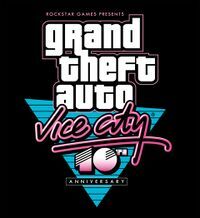 According to Lazlow Jones, Rockstar began working on GTA Vice City only one month after the release of GTA III. GTA Vice City is set in a fictional city based on Miami, Florida. GTA Vice City is set two years after GTA Vice City Stories which took place in 1984. All license plates are similar to Florida license plates, an orange logo resembling the state of Florida can be seen on them, some even having the Florida Gators logo. GTA Vice City is the only GTA III-era game (except Advance) not to feature the AK-47. However in the loading art, Phil Cassidy is seen holding one guarding his fort. GTA Vice City only took 9 months to make. GTA Vice City has more melee weapons than any other GTA game. The iPad version of the game has a glitch that causes the in car radio to stop working after the player drives a police car (this may be possible with other emergency vehicles). To fix it, go into the audio settings in the pause menu, then return to the game without making any changes. The radio should start working again. This page was last modified on 18 July 2017, at 22:44.